Diana Rattray. The Spruce Eats, 2004. These cranberry scones are perfect for holiday mornings. 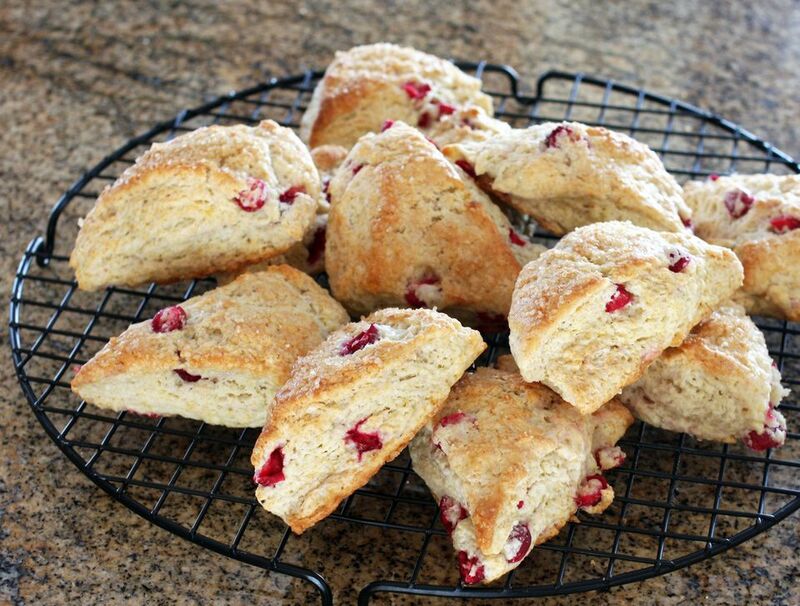 The scones are flavored with fresh cranberries, chopped nuts, and a little fresh orange zest. Use walnuts or pecans in the scones, or change them up and make them with chopped pistachios or hulled pumpkin seeds. Or if you aren't a fan of nuts, you can leave them out. Grease and flour a large baking sheet or line it with parchment paper. In a large bowl, combine flour, 1/2 cup sugar, baking powder, baking soda, and salt. Stir to blend. With a pastry blender, cut the butter in until mixture resembles coarse crumbs. Stir in cranberries, walnuts or pecans, and grated orange peel. Mix buttermilk in with a fork just until dry ingredients are moistened. On a floured surface, roll or pat dough out into a 3/4-inch thick circle. Cut into rounds with a 2- to 2 1/2-inch cutter or cut the circle into wedges. Place the cut-out scones on the prepared baking sheet, about 1 1/2 to 2 inches apart. Brush them with milk or evaporated milk. Combine 1 tablespoon sugar and 1/4 teaspoon cinnamon; sprinkle a little of the mixture over each scone. Place the scones on lower oven rack. Bake for about 15 minutes, or until they're lightly browned.